Small cracks in foundation walls are common in homes throughout the South and North Carolina area. Usually a side effect of the natural curing process of concrete, these cracks usually do not threaten the foundation. Unlike epoxies or hydraulic cements, the special sealant used for FlexiSpan® can bond with both wet and dry concrete, and it's able to make its way into even the tiniest cracks and pores in the concrete. Additionally, hydraulic cements, epoxies, and even polyurethane injections are not able to bend and stretch along with your foundation movement. As concrete walls expand and shrink slightly through freeze/thaw and wet/dry cycles, the bonds of these materials will fail and the crack will releak. FlexiSpan® stays bonded with wall movement, and seals the crack permanatly, no matter what. 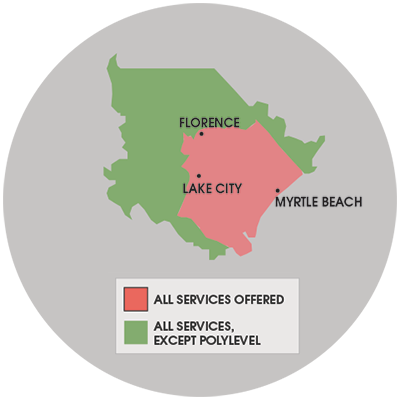 We serve North Carolina & South Carolina, including the Camden, Florence, Gaddysville, Loris, Marion, Myrtle Beach, Rembert, St. Matthews, Sumter, Tradesville, Trio area.